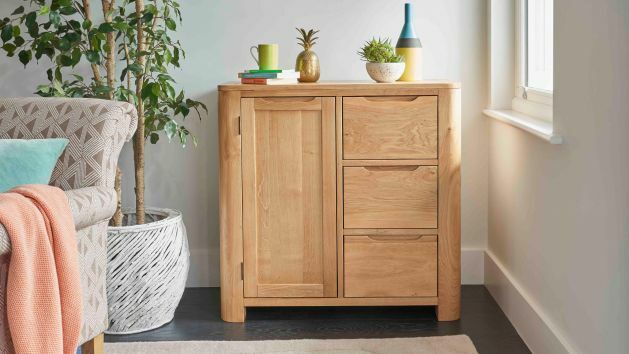 Storage can be practical and it can be elegant; we offer both, with our range of traditional and modern oak, mango and painted storage cabinets. You won’t have to choose between practical or elegant storage solutions anymore; with our stunning selection of hardwood units, we provide both in droves. Our range of storage cabinets has been made to complement our gorgeous furniture collections, rendered in both rustic and natural oak, as well as solid mango and painted hardwood. We craft our furniture using the highest of quality standard, so every inch of our storage cabinets are made from solid hardwood, even the drawer bases, backs, and drawer runners are only ever made from solid wood. We’ve also created a blend of storage options - from drawers to cabinets to shelves - so that no matter what you’re looking to keep safe, we provide for it. So if you’re looking for somewhere to store your DVDs in the living room, a place to tuck toys out of sight, or even hidden shoe storage in a hallway or entrance, our wide range of products will offer you something perfect. Browse today!